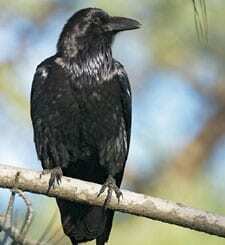 The intriguing Common Raven has accompanied people around the Northern Hemisphere for centuries, following their wagons, sleds, sleighs, and hunting parties in hopes of a quick meal. Ravens are among the smartest of all birds, gaining a reputation for solving ever more complicated problems invented by ever more creative scientists. These big, sooty birds thrive among humans and in the back of beyond, stretching across the sky on easy, flowing wingbeats and filling the empty spaces with an echoing croak.